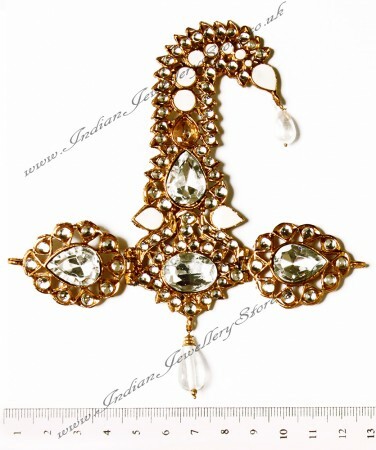 Indian kalgi (turban pin) in antique 18K gold colour and clear white. Set with meena work and kundan stones. Currently comes with maroon sting to fix to turban, but we can add part length of 3-standed faux pearl chain, for extra GBP 8, if you wish. Attached with string but also has a pin for secure fix. Indian Jewellery Store LOVES this product. Scale shown in image is in cm.